The Rio Grande Bean Dinner will be 11 a.m. to 3 p.m. Aug. 8 at the Bob Evans Farms shelter house. Admission is $4 for ages 10 and older. All veterans and children 9 and younger will be admitted free. RIO GRANDE — For the 145th year, the Rio Grande Memorial Association will honor those who fought in the Civil War with the annual Rio Grande Bean Dinner. The dinner will be 11 a.m. to 3 p.m. Aug. 8 at the Bob Evans Farms shelter house. Admission is $4 for ages 10 and older. All veterans and children 9 and younger will be admitted free. The event includes food, entertainment and door prizes, which will be awarded every half-hour. A bucket of beans will also be available for $5. The annual bean dinner began in Rio Grande in 1870, two years after neighboring Vinton held its first Grand Army of the Republic-sponsored celebration to honor Civil War veterans. The beans, hardtack and coffee were to serve as the village’s one-day sacrifice of eating and drinking what the soldiers were forced to survive on during breaks in the fighting. While the location for the event changed numerous times in its earlier days, Bob Evans Farms has served as its host for the past 44 years. 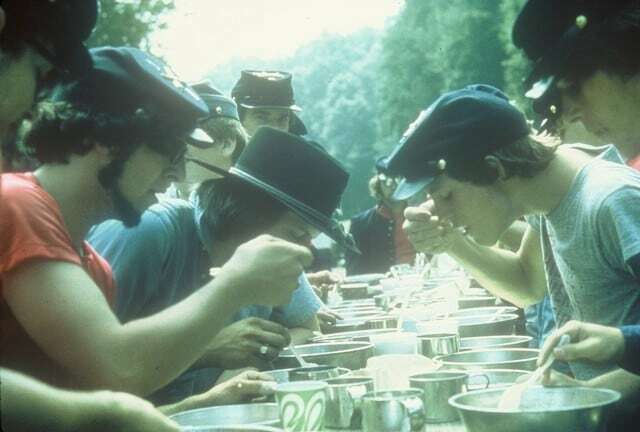 In the early days, Union soldiers would be invited to the bean dinner as guests and would arrive in uniform to be honored. As the years went by, attendance at the bean dinner has had its ups and downs, ranging from five people to 600 people. Regardless, many people give their time to keeping the tradition alive by tending to the large kettles and cooking a meal the community can enjoy as people gather to remember times often forgotten. The dinner now honors veterans of all American wars. For more information, contact David Smalley at (740) 709-4971 or “Lib” Ramey at 740-245-5883.